· The worst performing metal this week was palladium, down just 1.02 percent, as hedge funds cut bullish positioning to a 5-month low. Turkey’s gold reserves fell $154 million from the previous week, with total reserves now worth $20.8 billion, according to central bank data in Ankara. U.S. Mint data shows that American Eagle gold coin sales fell 8 percent in March, marking two straight months of declines after reaching a two-year high in January. · Improving global growth and surging stocks are luring investors away from gold and into riskier assets, writes Bloomberg’s Vildana Hajric. Outflows from U.S.-listed commodity ETFs totaled $1.25 billion in the week ended April 4, which is a big drop from deposits of $128 million the previous week. Precious metals ETFs saw outflows of $943 for the week. Data compiled by Bloomberg shows that ETFs cut 379,577 troy ounces of gold from their holdings on Tuesday, which is the biggest one-day decrease in at least 12 months. · Ronald-Peter Stoeferle, managing partner at Incrementum AG, says that gold is poised to rally to $1,450 to $1,500 per ounce by year end if it breaks through the $1,360 to $1,380 per ounce resistance level. Stoeferle says that one of the drivers will be demand from pension funds, high-net worth individuals and wealth managers. Bloomberg writes that Stoeferle also cities his fund’s own inflation indicator to support his bullish gold view, which is currently showing increasing momentum. 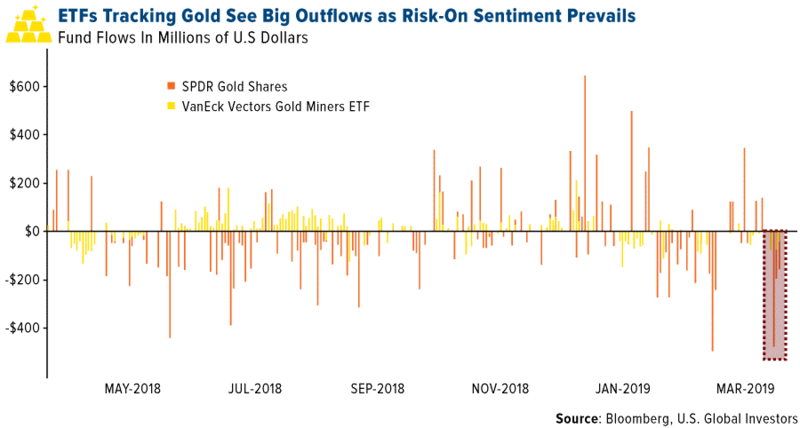 Goldman Sachs is also bullish on the yellow metals as it expects a rebound in ETF holdings to continue due to late-cycle worries and negative German 10-year real rates. · More bullish views of platinum ahead. Bloomberg’s Rupert Rowling writes that the precious metal is set to climb above the $900 per ounce level on speculation of strikes at South Africa mines. Demand is also being driven by platinum being considered as a substitute for palladium for use in autocatalysts. Bloomberg’s Mike McGlone writes that platinum is likely in the early days of its recovery, based on the palladium versus platinum ratio. · China’s second largest, publicly-listed gold producer, Shandong Gold, is looking to make an acquisition by the end of this year. Chairman Li Guohong said in a briefing in Shanghai that “we are more optimistic on gold prices this year than last year” and that other mergers and acquisitions in the sector are proof of bullish consensus on gold prices. Wesdome Gold Mines Ltd. rose 9.72 percent for the week after announcing that its gold production was up 6 percent year-over-year, producing 19,010 ounces. Higher grades were delivered to the mill and the company maintains a strong cash position. · The Eastern Shore community in Nova Scotia is rallying against Atlantic Gold’s proposed open-pit gold mine in the area. The community opposes the project strongly because it could damage a river that has been heavily protected for over 40 years. The Atlantic Gold project would also only operate for six years, but impact the environment significantly for many years after. · Senators in Italy voted in favor of a parliamentary motion calling on the government to clarify the legal status of the Bank of Italy’s gold reserves, reports Bloomberg. The motion also asks the government to obtain detailed information about the status of the central bank’s gold held abroad. It is unclear what the government is trying to do with the country’s gold. A separate motion by the opposition party that called for the repatriation of gold held abroad was rejected. · Palladium fell this week after President Donald Trump threatened to close the border between the U.S. and Mexico. A border closing would be negative for the U.S. economy and the auto industry in particular, which is the largest consumer of palladium.